The 2015 SEEC student symposium was held at the UCT Research Office at Cormack House in Mowbray on Friday 16 October, and was well attended by postgraduate students, postdoctoral researchers, staff, and a few visitors. The symposium is intended to give SEEC postgraduate students and postdocs experience in conference presentation, and an opportunity for all SEEC members to become familiar with the research being done in the group and also provide input to each other’s work. Res Altwegg opened the event, and highlighted the objectives of SEEC – to bring together field ecologists, statistical ecologists and mathematical statisticians and to promote collaborative research and supervision. SEEC’s vision is to produce world-class relevant and useful research that is statistically and ecologically sound. All the talks highlighted the importance of using appropriate statistical tools to describe ecological systems. The impact of ecological research on environmental management decisions and policy development – particularly on the key issues of rapid climate change, land use change and loss of biodiversity – depends on the quality of the research process, from start to end – hypotheses, sampling and data, analytical methods, results and synthesis. Studies in all stages of academic progress were presented, from early-stage Master’s and PhD projects to theses and post-doc papers in various degrees of completion. 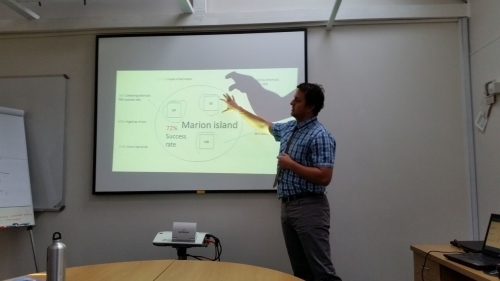 Michael Schaub of the Swiss Ornithological Institute closed the symposium with a highly interesting plenary talk discussing his work on modelling immigration dynamics in bird populations. There was time for questions after each talk and lively discussion during the breaks. This second SEEC symposium built on the success of the first symposium held at Kirstenbosch in 2014, and we look forward to the next one. Special thanks go to Sue Kuyper for planning and coordinating the event, venue and catering.